Please call Jill to check availability for the period you require. You can then download, print, complete and post a booking form together with your £50 deposit cheque. Thank you. 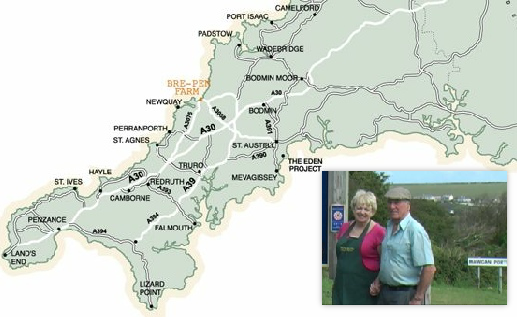 Follow the A30 through Bodmin towards Newquay until you are sign posted to Indian Queens and the Airport. 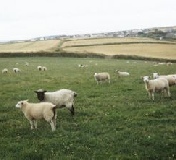 Turn off the A30 at Highgate Hill and follow the A39 until you reach St Columb Major roundabout. Then follow the signs to Newquay Airport onto the A3059 before turning right towards St Mawgan. Pass the airport on your left and you come to a T junction. Turn right for Mawgan Porth - through Trevarrian. 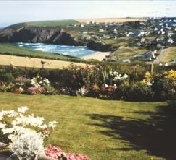 The farm is approximately 1/4 mile (400m) on the left, before the hill down to Mawgan Porth. 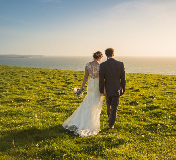 Flights are available from some UK and European airports direct to Newquay Cornwall Airport - less than 5 minutes from Bre-Pen Farm; we are happy to collect you from the airport if you arrange it with us in advance.